Angela’s 21st birthday party was fun! I took my light stands and good some good shots using two remote flashes. The photos look a lot like studio lighting so I am happy. Hayne, the band, originally uploaded by Iain Fergusson. I used a Nikon D40, and, in my left hand, held above my head, an SB-800 on a TTL cord (but used in manual) with a shoot through umbrella. Shameless Modelling Launch, originally uploaded by Iain Fergusson. Launch Party for Shameless Modelling at Base night club. 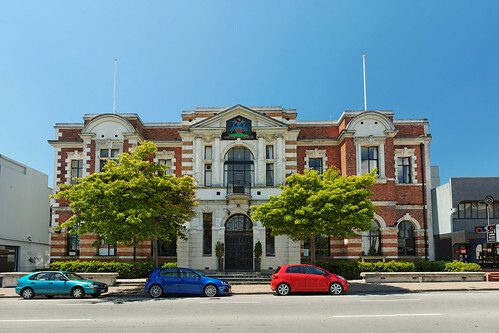 The old Civic Chambers, originally uploaded by Iain Fergusson. The New Zealand Historic Places Trust wants photos of registered historic places, so I started to take photos of the old buildings around town. This is the old Civic Chambers on Manchester street. The photo is a stitched panorama taken hand-held with my Sigma 30mm lens, and polarising filter. I used Hugin to stitch the images together. It required some fiddling because of the parallax errors introduced by hand-held shooting. I shot RAW and used DxO Optics to bring detail out in the shadows.